At over 310 years old, the town of Canterbury has its roots buried deep within Connecticut. This New England town offers a unique mixture of historical tradition, quiet residential neighborhoods, small businesses, and beautiful outdoor spaces. Protect your Canterbury home or business from New England pests with the help of the experts at Big Blue Bug Solutions. While we haven’t been around quite as long as Canterbury has, we have been providing exceptional pest control services for more than 80 years. Let us put into place the prevention and control measures that are needed to protect your Canterbury home or business from silverfish, earwigs, pantry pests, stinging insects, ants, spiders, termites, and other common invaders. Give us a call today to learn more about any of our quality, affordable, and eco-friendly services! At Big Blue Bug Solutions offer a wide variety of quality, affordable pest control services; we have what you need to protect your home and family from Connecticut pests! To protect your home year-round from a wide variety of common household pests we offer our Home Owner’s Policy (HOP). HOP provides our customers with three visits per year from our knowledgeable and friendly technicians, preventative treatments, and the on-going monitoring of the vulnerable areas in and around your home. Through this program, we provide our customers with the guarantee that if pests become a problem in-between our visits we will return at no charge to you to take care of the problem. We also offer our exclusive Blue Glove Service, which guarantees that your home is as clean after we leave as it was when we arrived! Give us a call today to learn more about putting into place any of our residential pest control services in your Canterbury home. Silverfish grow to between 1/2 and 1 inch in length, with brown bodies covered in shimmering silver scales, and a tear-dropped shaped body with three bristles coming off of the hind-end. Their most unique feature, however, is the fish-like way that they move across surfaces, which along with their striking color is where they received their name from. These pests tend to enter homes and other buildings in search of a high humidity environment to live in (kitchens, bathrooms, laundry rooms, and basements) that is near a food source. To keep these annoying and potentially damaging pests out of your home, it is very important to inspect your home’s basement walls and foundation, sealing any cracks and crevices that silverfish could squeeze their bodies through. Then it is time to check for any gaps around windows and doors, caulking any openings that are found. Door sweeps should always be placed on exterior doors, and in rooms or areas of your home that have high humidity levels dehumidifiers should be installed. But the best tip of all is to put into place a year-round residential pest control program from Big Blue Bug Solutions and you'll never need to worry about silverfish or other common household pests making themselves at home inside of your Canterbury home again. Call us today to learn more. 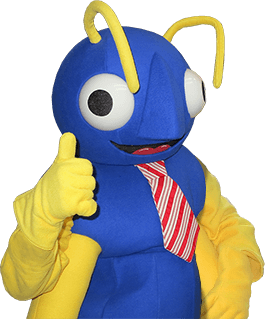 At Big Blue Bug Solutions we want to partner with you to ensure that your Canterbury commercial facility becomes and stays pest free. It makes a big difference when you can be sure that Connecticut pests aren’t damaging your commercial property, introducing health risks to your employees and customers, and are not damaging the reputation of your business. To control pests in commercial properties we have developed our Monthly Maintenance Program. The Monthly Maintenance Program includes once a month visits, at which our professionals monitor all pest activity and perform preventative treatments. If ever pest activity is detected we will take care of the problem immediately if possible. For pests like termites or bed bugs, however, we may take additional planning and time before treatment can begin, so that the job is done right the first time. In addition to our Monthly Maintenance Program, we offer other solutions to keep pests out of your facility like Integrated Pest Management techniques, and drain cleaning. Contact us today to learn more about our commercial pest control solutions. Give us a call to learn more about termites and how we can work together to ensure that these damaging pests are kept out of your Canterbury home. The actual treatment work was performed by Mr. George Sweet. I cannot say enough how pleased we were with his excellent attitude, demeanor, courtesy and especially his outstanding workmanship. His obvious pride as an employee of New England Pest Control was evident throughout the time and effort he demonstrated while here. We were especially pleased with his (Mr. Sweet's) attention to detail to return the property to the condition it was prior to the termite treatment process.